FFA - National leaders called on Tampa Police Department to reopen death case of Fatima Abdallah which looks like an honor killing. 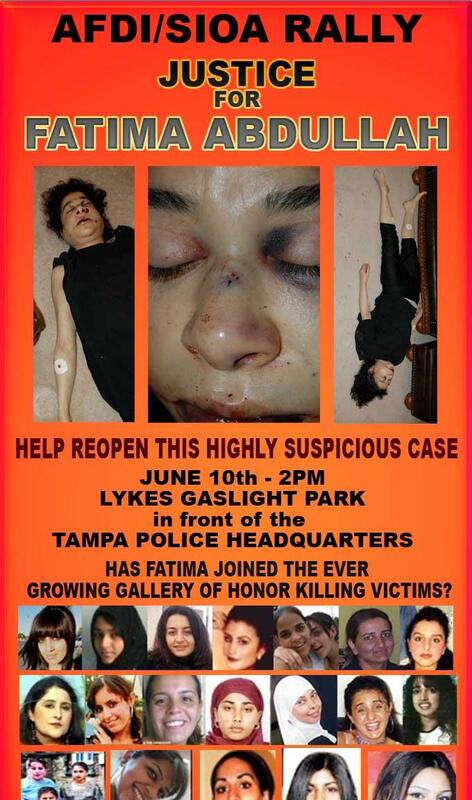 Pamela Geller, Robert Spencer and Nonie Darwish called upon the Tampa Police Department to reopen the death investigation of Fatima Abdallah during a news conference rally on Friday, June 10, 2010, 2:00 pm at Lykes Gaslight Park in front of the Tampa Police Department. Pamela Geller (top left), Robert Spencer (top right) and Nonie Darwish (bottom left) called upon the Tampa Police Department to reopen the death investigation of Fatima Abdallah during a news conference rally on Friday, June 10, 2010, 2:00 pm at Lykes Gaslight Park in front of the Tampa Police Department. Tampa Police have determined that Fatima Abdallah killed herself by repeatedly striking her face against a coffee table and the floor. It is Florida Family Association’s opinion that given the circumstances of Fatima’s personal life and the facts surrounding her death that her demise looks more like an honor killing. Florida Family Association has called upon Mayor Bob Buckhorn to have the Tampa Police Department reopen and fully investigate Fatima Abdullah’s death. However, Mayor Buckhorn, Tampa Police and State Attorney Mark Ober have not changed their position regarding reopening this case. Click here to send your email asking Tampa Mayor Bob Buckhorn to reopen this case. Pamela Geller is the founder, editor and publisher of Atlas Shrugs.com and executive director of the American Freedom Defense Initiative (AFDI) and Stop Islamization of America (SIOA). She is the author of The Post-American Presidency: The Obama Administration's War on America with Robert Spencer (foreword by Ambassador John Bolton), published by Simon & Schuster, and is a regular columnist for World Net Daily, Andrew Breitbart's Big Government and Big Journalism, the American Thinker, and other publications. Robert Spencer is the director of Jihad Watch, a program of the David Horowitz Freedom Center, and the author of ten books, including the New York Times bestsellers The Truth About Muhammad and The Politically Incorrect Guide to Islam (and the Crusades) (both Regnery). He is coauthor, with Pamela Geller, of The Post-American Presidency: The Obama Administration's War On America (Threshold Editions/Simon & Schuster). Nonie Darwish is an Egyptian-American human rights activist, and founder of Arabs For Israel, and is Director of Former Muslims United. She is the author of two books: Now They Call Me Infidel; Why I Renounced Jihad for America, Israel and the War on Terror and Cruel and Usual Punishment: The Terrifying Global Implications of Islamic Law.